it is better to have all the auto-funtions turned off.If they are greyed out you can use a tool named windows-enabler to dissable it. What kind of filter are using to block the normal light? That exposure slider must be more to the left. That's the white balance set to auto. I changed it manually to fluorescent or incandescent, but it didn't have an effect on the FPS. I'm using it currently without a visible light filter by just turning the room lights off (playing in a dark room). I do have one of those TV remote dark plastic bars which block out the visible light. Using it gives me the same results (17FPS, with 3FPS jitter). Maybe this webcam isn't just good enough. EDIT: Actually, I tried the auto-exposure trick again and it worked. This time the lag went away, no idea why. Edited by justonce01 on 13/11/2013 at 15h36. 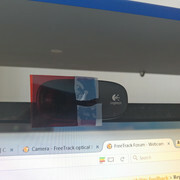 I use Logitech's C270H webcam and it works great. No disassembly is required, just stick 3 layers of exposed films in front of the camera, and VOILA! Works flawlessly. I have a build in webcam(Laptop) but the FreeTrack Program cant find it? Is it because build-in camera's dont work with FreeTrack? Sony ps3 eye. It rules. I crank it up to 112 fps and it's smooth as on my crappy system. took the IR filter out. it was no hassle. I play ARMA 2 for the terrain and the easy flight model. Fave MOD is "the few"
Is it possible to remove the IR filter in the C270? But,...in new versions of the c270 (august 2014) the chip and the filter are not seperable anymore- it looks like chip and filter are a single piece now. Okay, I purchased the Logitech C250. It works on Windows 8.1. You have to remove the IR filter, but that shouldn't be too hard. The tutorial for the C200 (http://www.free-track.net/english/hardware/filter_removal/logitech_webcam_c200.php) worked fine, but in the C250 the frame is glued aswell as fixed to the board by screws, so that shouldn't be a problem. I am still fiddeling with setting up everything, but I really recommend the camera. Hey there, i build my trackig system whith a "Hama AC-150" Webcam. It was realy cheap only 10€. First i had a problem with the FPS. Only 8FPS. I managed to increase the FPS by switching the illumination of the Camera to -7 and switching off the compensation at low light. can someone give me some advice please, i have this web cam and i would like to know a bit more about the IR filter, it has me confused. i'm running win7 64bit and i cant get a driver for this camera, so i have since purchased a Microsoft LifeView HD VX 3000. Edited by Angus94 on 06/08/2016 at 03h36. Unfortunately I know nothing to tell you about its ir-filter. Ever heard of facetracking?With this your face is tracked not your leds.With this you don't need to modify your webcam.But just like with ir-tracking the light conditions in your room can be a problem. I wil show you some links with more stuff/software you can use for tracking. 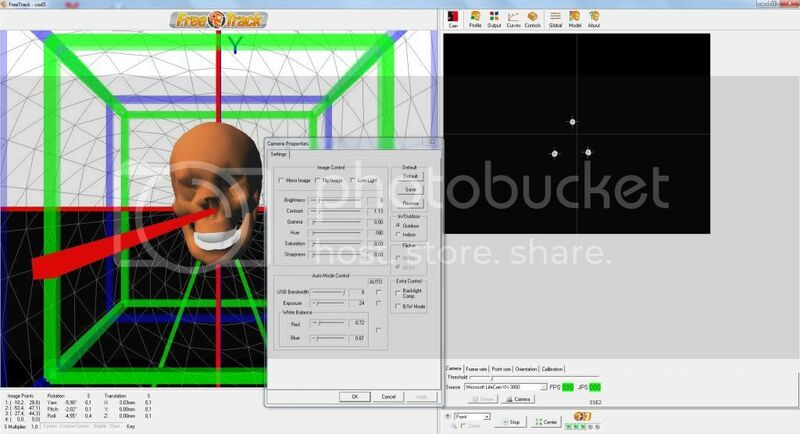 The next piece of software is not for free, it costs you something like €2,85 but supports a lot of things you can use for tracking, including facetracking.This is used than instead of freetrack. Opentrack and Ftnoir are still updated and developed and added more features. I just stuck the two blue / red pieces of film that come with the DelanClip package with tape in front of the lens (see next image) and it works, this is needed with direct sunlight. 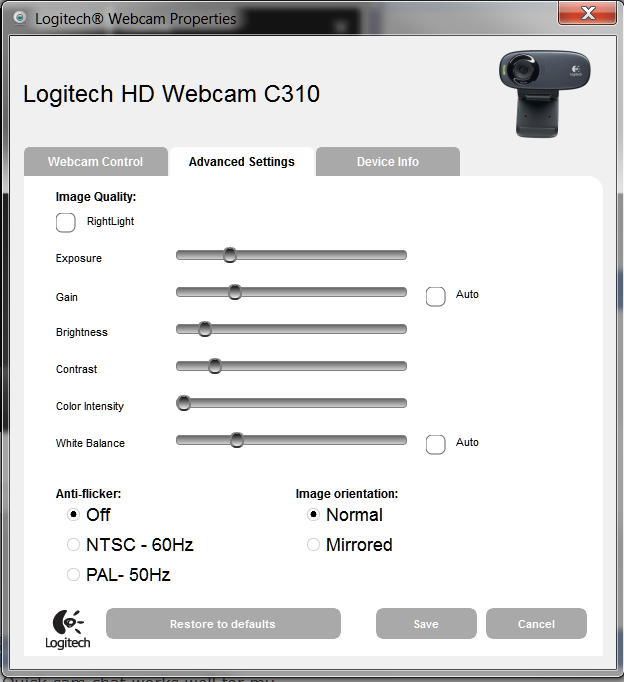 Settings are easy to tune with the Logitech Webcam Software (you just need to open the Logitech Software, go to Quick Capture, open the Controls Tab by clicking on the right hand side button and finally clicking on advanced settings). FOV is good enough, it never loses my head movements. I use it with Opentrack 2.3.1.6 and everything is working as expected. Edited by brubblu on 07/05/2017 at 10h31.